Chanteur Country US né le 29 Avril 1972 à Winter Park (Floride). A country music wonder, James Bonamy's success strings from his everyday experiences. His country hits "I Don't Think I Will," "Naked to the Pain" and "Daddy Never Had A Chance" have all reached the American country music charts. As a budding young country artist James Bonamy has made a style all his own, with a concentration on what is in people's hearts. With every song he tries to strike a chord with people. Born in Winter Park, Florida, James Bonamy grew to love country music because of his father's influence. Although he did listen to some rock as a teenager, James Bonamy was attracted to country music's messages and the way the songs seemed as if they related to everybody. His influences include such musical legends as George Strait, Johnny Paycheck, Keith Whitley, Clint Black and Merle Haggard. 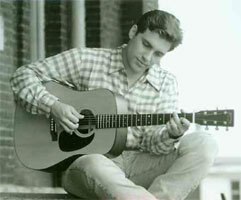 Before seriously pursuing a professional music career, James Bonamy spent one year studying at the University of Alabama. He first performed in Nashville at Opryland in a program called Country Music USA. His first album, What I Live To Do, was released on the Epic label. The title was a direct reflection of James Bonamy's life. The songs related his interests and what his life encompassed. The 1995 release included such hits as "She's Got A Mind of Her Own," "All I Do Is Love Her, ""Heartbreak School" and "The Devil Goes Fishin'." It was this album that caused James Bonamy to come to the realization that people care about the same things. Performing in concerts all across the country, the young singer relies on the support of his father and wife Amy Jane. The two have a son, James Daniel. In his 1997 Epic release, Roots and Wings, James Bonamy once again relies heavily on his life experiences. He plays a variety of country music on this album, including love ballads, toe-tappers and energetic popular songs. "Daddy Never Had a Chance" reflects the influences of Conway Twitty, whereas "The Swing" provides a jubilant, toe-tapping country song. The album also includes the love ballads "Naked to the Pain" and "When God Dreams." Aside from recording and performing, James Bonamy also finds time to devote to his fans. He appeared on Live with Regis & Kathie Lee performing his first solo hit "I Don't Think I Will." He has been on Entertainment Tonight and was interviewed by People magazine. Among his numerous recognition's, he was nominated as Male Star of Tomorrow at the TNN Music City News Country Awards. Entertainment Tonight voted him Hot New Country Male Performer. The Academy of Country Music nominated him Top New Male. Recently he was inducted into The Music Valley Wax Museum. Despite this plethora of fame, James Bonamy's first concern is his music. He remains dedicated to composing and playing songs that his fans will take to heart.